The timing was particularly nice as that picture is also the main image in a panel I am exhibiting at the Mall Galleries in London this week. The other two images appear below. I hung my panel on Saturday and the private view party was that evening. Much fun was had by all; I caught up with some friends and met lots of new ones and the party continued on afterwards in Covent Garden. The exhibition is called Light and Land on the Mall and it is open until Monday 10th August. I am heading up there again tomorrow to meet some more friends and possibly on Friday as well. If you are thinking of visiting, let me know – maybe we can meet for a coffee. Although the exhibition is hung now, the work continues as I am participating in another exhibition next month, again in London, at the Oxo Tower, with a larger panel of different images (black and white this time). Then, in October, I have my first solo exhibition, at Arté Gallery, kindly sponsored by Martin & Wheatley. More anon. A well-earned glass of wine at the Private View party. Phew! This entry was posted in art, photography and tagged exhibition, landscape photography, London, photography, photography exhibition, photography magazine, publication by Rachael. Bookmark the permalink. Great colours – sort of take you away…. Thank you very much, Lauren. It’s a special place. 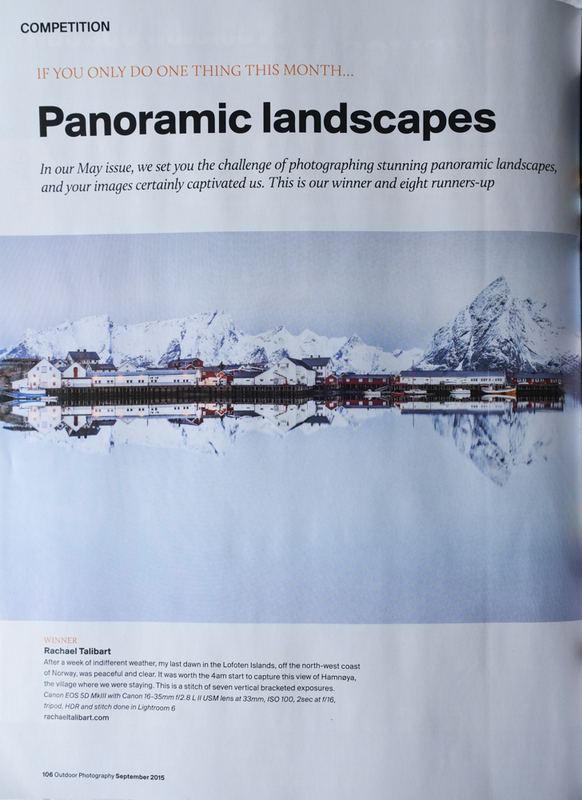 Congratulations on the competition win – that is a beautiful panorama. It’s such a crisp and lovely sharp photo. I feel like I can feel the chill on my face just looking at it. Wonderful work, Rachael. Thanks! It was so peaceful there in the pre-dawn light. Spectacular shot of the Lofoten Islands! I need to start a subscription to Outdoor Photography, as the photographer I have taken a workshop from (Bryan Hansel) also has mentioned it. Thanks, Kat. It’s a super magazine. You won’t be disappointed. Congratulations Rachel! I love the minmalist work! Thanks! I am heading that way more and more with my colour images. Glad you like them. Hi Amelia. Thanks! I really appreciate your support through the years, especially lately when I have been too busy (disorganised) to be a good blog reader. Congratulations, it is a beautiful image. These are absolutely gorgeous! Love the simplicity and negative space. Congrats! About time others discovered what we already know — you are an incredibly talented artist. Warmest congrats, Rachael, from your bug bud in Texas. That winner is certainly a winner! DirtNKids has been missing you. Cheers, Lady. Thanks! You are so kind. 🙂 I know I have been terrible at keeping up with things on WordPress this year. There just seems to be no time with the new business and all the exhibitions etc. Must do better! Don’t fret. I’m not going anywhere. Anyway, the daily grind of life is soooo much better than blogging! I just don’t have too many readers who enjoy bugs; the crickets are winning over as my audience. LOL Keep it real, Lady! Congratulations . . . and it seems it would merit a larger glass.. Thanks. 🙂 I may have had the odd refill, or two, or… (well, you get the idea). 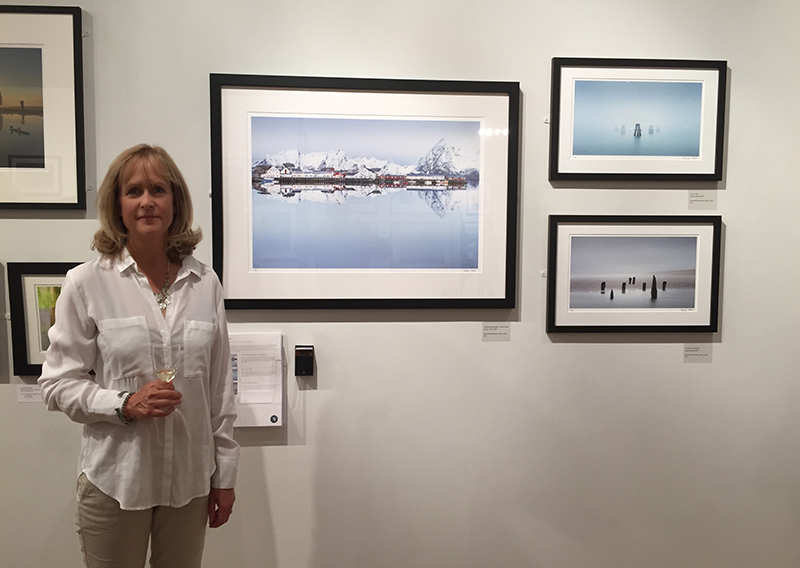 Great set of images, Rachael, really enjoyed seeing them printed big and framed on the wall at the Mall Galleries! Hi Astrid. Many thanks and ditto!